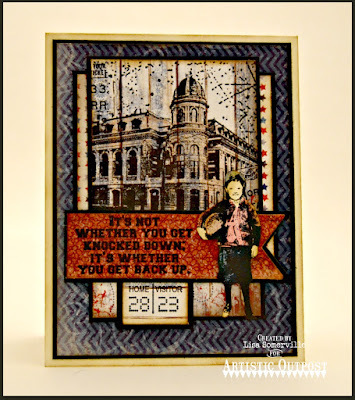 Welcome to the Artistic Outpost October New Release and Blog Hop! 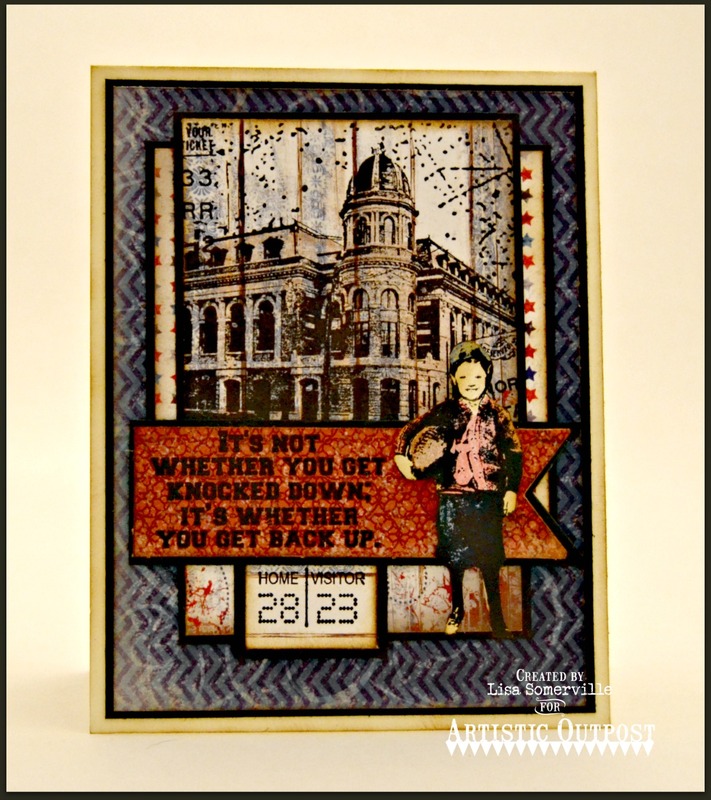 This month, Artistic Outpost is releasing three stamp sets, click here to see the new releases! Keep reading below to see how you can win a $15 Artistic Outpost Gift Certificate! Today, I'm sharing two cards, one using the new Go Team stamp set and the other uses images from the new Toy Emporium stamp set along with one of my favorite older AO sets, Sleigh Ride. Both cards also use paper collections and Custom Dies from Our Daily Bread Designs (see supply list below). Before I share the details on how I created my cards, I wanted to let you know that you can now order your AO products from the ODBD Website, that way you can save on shipping if you are also ordering products from ODBD and NCC! Using images from the Go Team stamp set, I stamped the Stadium on scraps of the ODBD Patriotic Paper Collection, then colored the image with STAEDTLER Watercolor Pencils. The football player from this same set is stamped in Black Archival on Vanilla card stock, then colored with STAEDTLER Watercolor Pencils and popped up on dimensionals. I used a SAMJ to add the sentiment to the scrap of paper. The sweet vintage girl is from the Toy Emporium stamp set. 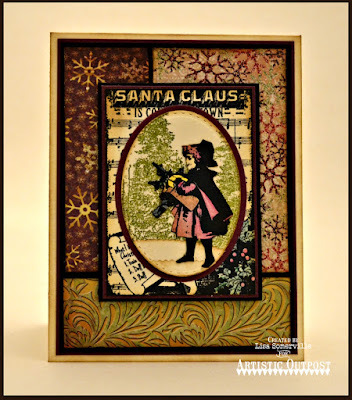 To create the collage, I stamped the trees from the Sleigh Ride set in Olive, then die cut the panel using Our Daily Bread Designs Stitched Ovals Dies. The hills were added using scraps that I die cut using the Leafy Edged Borders Die. The girl is stamped in Black Archival on Vanilla card stock, colored with STAEDTLER Watercolor Pencils, cut out and adhered over the stamped trees. 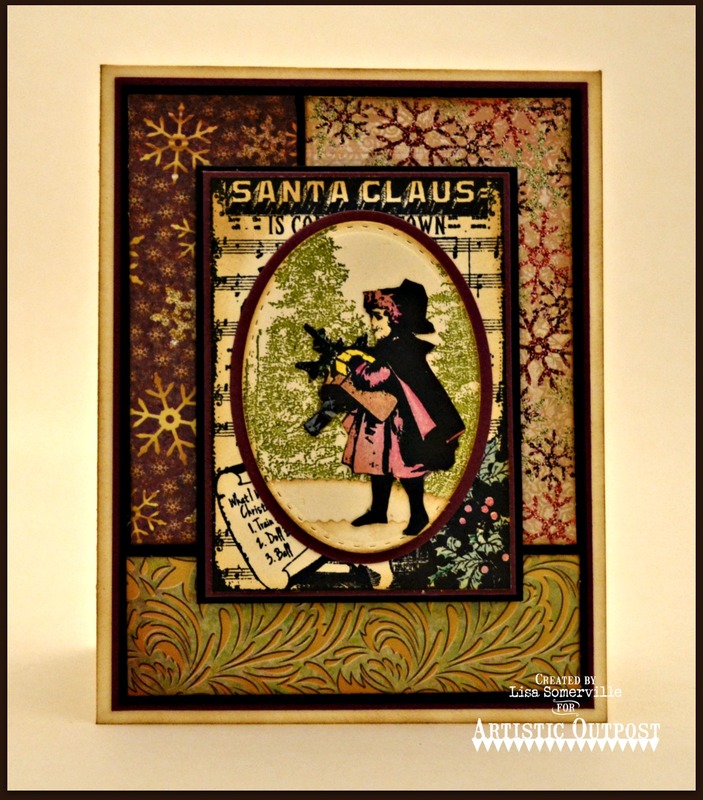 I layered this panel on a Raspberry panel that was die cut using the Ovals Die, then layered onto the stamped ATC panel from the Toy Emporium stamp set. All pattern paper is from the ODBD Christmas 2015 Paper Collection. Just for commenting on the Design Team Blog Posts, you have a chance to win a $15 Artistic Outpost Gift Certificate, good towards the purchase of AO Stamps. You have until October 9, 2015 at 10:00 PM CDT to leave a comments on the participating designers blogs for a chance to win! Three random winners will be selected from the comments left on the designers blogs, the winners will be announced on the AO Blog on October 10, 2015, be sure to check back there to see if you have won! Lisa, Love your beautiful cards. Thanks for the great ideas. LOVE your cards! The football set is very fun and your design and papers and everything is awesome. The little girl and the design again is just lovely! Wow, I love your cards! I've always leaned to the vintage women but I really love the football set. Great set for manly cards! Your cards are beautiful, Lisa! I love the rich colors you use which goes so well with the themes. Lisa, you always work wonders with layers of paper and I just adore how you have both the little football player and Christmas girl taking front stage! Two absolute beauties! Stunning makes, Lisa. So much to look at in the background! I love your use of the various dies. Very creative placement. wow! You used these images to their greatest potential, especially the stadium from Go Team! Just 2 beautifully put together cards! Lovely vintage look to them! You sure can make these images dance! Love the layouts and papers you used, fun.